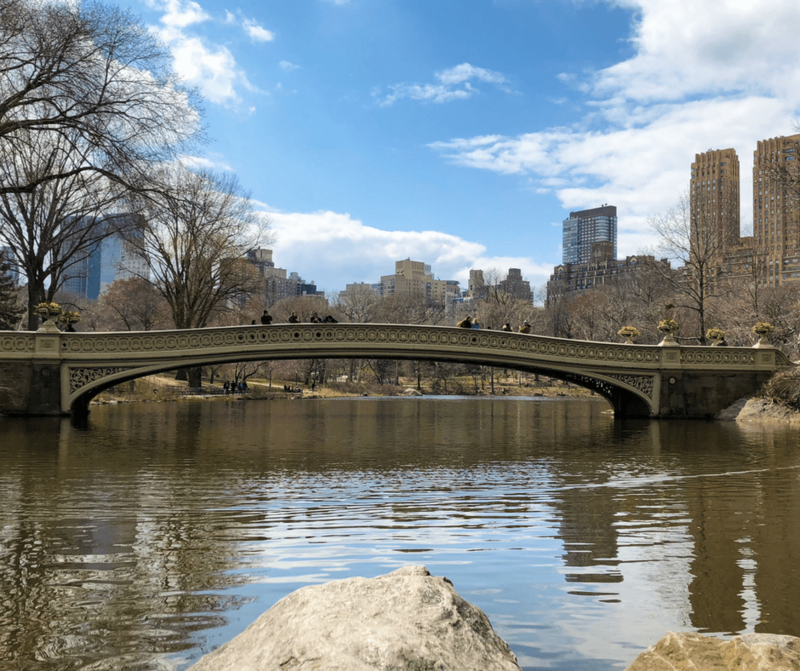 This week we’re taking a look at my Central Park Favorites! These are a few of my favorite things to see and do in the 843-acre park within the concrete jungle of New York City. Central Park is like a gigantic maze…you can easily get lost. I use the Central Park NYC Lite app to help navigate and combine it with Google Maps so I can head directly to certain locations if need be. This post contains affiliate links. It is at no additional cost to you, and I only recommend products/deals that will help you get the most out of your travel experience. For my Full Disclosure Click Here. These aren’t in any special order…just random locations I’ve sought out or stumbled upon during my trips that have become my favorite in Central Park! Polar Bears, Penguins, and Leopards…Oh, My!! Who would have thought…a zoo in the concrete jungle! It wasn’t quite what I expected when we walked through, but is definitely one of my favorite locations in the park. On to the gorgeous bridges of Central Park. It’s crazy how many bridges and archways you will come across while exploring Central Park. Would you believe there is a hidden castle inside Central Park?? Belvedere, meaning “beautiful view” in Latin, Castle sits atop Vista Rock and is the highest point to take in views of the park and city surrounding it. On my April Trip to NYC, it was closed and I later found out the city closed it for refurbishment on February 26, and it will reopen to the public in 2019. Definitely add it to your future plans!! Moving on to the Statues of Central Park. although I’m sure you’ll find those in Central Park as well. it’s the perfect picnic location and even though I haven’t had one yet, a picnic in Central Park is on my NYC bucket list for my next trip!! where Carrie and Big meet at the Boathouse Restaurant and end up falling into the pond?!?! It seems it’s always closed when I go to NYC! It’s on the bucket list too though! It was here, on December 8, 1980, that John Lennon was murdered. The 2.5 acres of Strawberry Fields pays tribute to the musician and peace activist. is a must see and is typically covered with flowers and candles honoring his life and memory. perfect for a spring or autumn day in the city, or a romantic date night, or just to let your feet rest! You will do a lot of walking while in New York City, and most definitely while in Central Park. and is definitely a must see! Once a supply store supplying milk to the Upper East and West Sides of Manhattan, now is a gift shop and information center. and you can even take home the very flowers that you find in the gardens of Central Park!! when you buy something the proceeds go to the Central Park Conservancy, which helps raise 75% of Central Park’s annual budget and is responsible for keeping the park clean and beautiful. Click Here for more info on how you can help the Central Park Conservancy Organization. These are just a few of my favorite locations and things to see while visiting Central Park. The park is huge and there is still so much I haven’t explored yet! I am planning for a May 2019 trip back to NYC to see the city in bloom! Be sure to Subscribe Below to receive this week’s Bonus Article: American Museum of Natural History: New York City Edition! Enjoy Your Journey to the Big Apple!! What’s your favorite spot in Central Park?? To Shop my Favorite Travel Gear Click Here!! Subscribe Now for Future NYC Planning Articles! !